What is Maildir File Extension, Directory Structure & Maildir format Benefits? What is Maildir File Extension? With the advanced technologies, a large range of email applications and mail servers, which are emerging out with the respective file formats. One such file extension is Maildir, which acts as a directory used by email applications for saving all messages and data items with a unique name. It may be noted that Maildir file is a structured file format in order to maintain some email messages. In simple words, this file only contains the email messages in a strutured order. 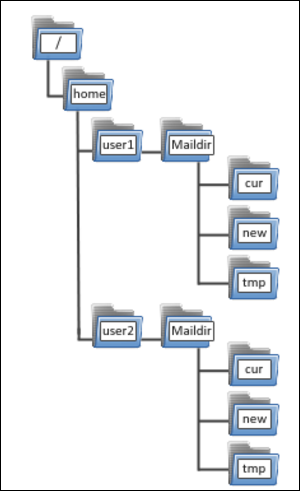 The Maildir file format was initially implemented by Qmail application and to preserve mailbox data as an organized manner. Moreover, most of the users are not getting familiar with internal details of Maildir format, its internal structure, and much more information. In the following section, we are going to discuss on what is Maildir file extension in a detailed manner. temp: It includes a temporary data file associated with the Maildir file extension directory. new: All incoming email messages are saved in this sub-directory, only for limited time. It is just a means to notify the user "you have new message"
cur: Also, it contains the common messages as a new sub-directory. The main difference is it can save only those messages, which have been read. Thus, users must have to examine that Maildir diraectory facilitates the special consideration to distinguish between the read and unread emails as well. Therefore, cur directory may be analyzed to locate each and every read messages. Also, we can examine that the home directory generates separate Maildir directories for each end user. So, one can navigate the particular Maildir file directory to browse through all the sub-directories. The major advantage offered by this file format is that it can easily classify into different sub-directories. When a new email message arrives, the messenger will start to filter accordingly and moves in the respective sub-directory. These files can be used over the distributed file system without any sort of compatibility problems and issues. It is really helpful to share the data and access over a network. It is the convenient file format that helps to delete, locate, or retrieve all email addresses too. Also, it can easily handle multiple emails in a reliable and flexible manner. Maildir directory creates one single file for every incoming mail messages. Basically, Maildir file format is an efficient way for storing the email messages, where each message kept in a single file with a unique name. Each file has its own way like its structure, directory information and so on. Along with, we have covered the various aspects of file format to let the users understand about what is Maildir file extension and the internal structure as well.